Over the past five years, Houndmouth has gone from a local band in southern Indiana to an act that consistently puts on electrifying concerts in clubs and theaters across the nation. The alt-country band’s live shows of the past were refreshingly unique; the band’s chemistry was evident each and every time they stepped out onto the stage. You could see in their facial expressions and body language that their collective passion and love for music was as intense as they come. Unfortunately, a huge part of what gave them this vibe left the band in April. Keyboardist (and singer of almost a third of the band’s songs) Katie Toupin left the band citing an interest to “pursue other opportunities”. 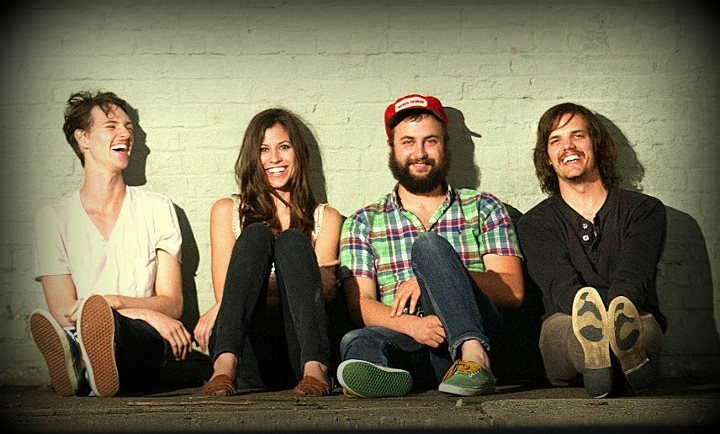 The remaining members of Houndmouth, front man Matt Myers (guitar/vocals), Zak Appleby (bass/vocals), and Shane Cody (drums/vocals) were left without an integral piece of their band with shows scheduled just weeks away. Instead of rescheduling them, they assembled a group of three fellow musicians to tour with them. Two saxophone players were added along with a keyboardist to bolster their touring band. They almost immediately started playing shows with this lineup, but I was unable to see them until now. Having been a huge fan my first two times I had seen them, I was unsure of what to expect going into last Thursday’s show at the Castle Theater. The band opened up with what was arguably the most popular song from their 2013 debut album, the fittingly named “Come On, Illinois”. The group began with less energy than usual, but as the concert progressed they became more and more like the band that I knew. Their general formula in constructing the show’s set list was to play a couple of fast-paced songs followed by one or two of their ballads. Because of this, the concert had exceptional flow, and no song seemed out of place (almost like a well-constructed album). By the time their fifth song of the night, “Darlin”, was played, the entire theater was screaming the lyrics along with Myers. From then on, the show only got better and the fans only got louder. Though their most recent album, 2015’s “Little Neon Limelight” was a bit more popular than its predecessor, 2013’s “From the Hills Below the City”, they spent a large portion of the concert playing tunes from their first LP. A couple of their common live staples “One For the Road” and “Casino (Bad Things)” were missing due to Toupin’s absence, but the band made up for it by adding a new flare to some of the songs they’ve been playing since they first started as a band. Keyboardist Caleb Hickman was phenomenal and often played things differently than they were initially written. Improvisation seemed to be an important aspect of his playing, and it truly rejuvenated some of these tunes (not that they needed it). The saxophones were tremendous as well. In fact, the most important thing to note from this concert was the dual saxophones. It wasn’t as if they were only occasionally being thrown in: these guys played on every single song. Houndmouth took songs that have never been recorded or performed with saxophones and made them a part of each song’s structure. For some of the songs they simply provided background noise, but in others they arguably became the central figure. Both saxophonists had solos at various points in the night, much to the delight of the audience. Is the band better now? I don’t necessarily think that. Are they worse? I wouldn’t say so just yet. The best way to describe this concert in comparison to the old ones is that it was just different. It had a different feel to it, there were different musicians and the songs were arranged differently. Maybe this is what they needed to keep their creative juices flowing. At the end of the day, this was an entertaining show. From the first guitar strum of “Come On, Illinois”, to the catchy chorus of the main-set closer “Sedona”, to their high energy final encore of “My Cousin Greg” , this concert was a good time. If and when Houndmouth decides to come back again, it is worth the twenty something dollars plus service charges to go see them. I recommend that you give them a shot: you won’t regret it.